A favourite poet had once written that the smell of mutton being cooked, on any given day, can outdo the fragrance of several blooming flowers taken together. My grandma would often sprinkle a mixture of powered cardamom, cinnamon and cloves on the cooked mutton before serving. In winters, she would garnish them with tufts of coriander leaves, finely chopped. (I was too small to know what orgasmic meant, so I would settle for the word ‘heavenly’ here). In Sanskrit, there is a saying: “Ghranen ardhha bhojanam” which means “having smelled is half eaten”. How true! Time flew. We grew up. Mutton, now is no more a Sunday-affair. The easy access to ‘savourites’ has diluted its charm. The fights among siblings for the most coveted cylindrical bone, the eternal tug of war between the bone and the mouth over the ownership of the brown bone-marrow, the potatoes half-slit and above everything, the richness of the aroma…the aroma that could magically transport you to the Wonderland of Alice, the kingdom of Narnia or the colourful world of Oz. If childhood was a fairy tale, I would have dog-eared the pages on ‘Sunday mutton curries’ forever. There were days when the father (and the Father of the nation) would be kind to me. Instead of coins to be dropped in earthen piggy banks, Baba would bestow upon me, a crisp green five rupee note. It was like winning a lottery. If 25 and 50 paise coins made the city of Paris, the five rupee note stood as tall as the Eiffel Tower. For a child, its monetary value was nil, but the olfactory sensations it spawned was enormous. The very first thing I always did was to bring the note close to my nostrils. The smell of fresh, new paper currency, unadulterated by human touch would reek of a smell so dreamlike. I cannot remember the last time I held one. The commonest of gifts from friends and relatives from foreign lands, were colognes, chocolates, cigarettes (alliterations amuse amateur authors). As children, tags and signs like ‘Made in USA’ fascinated us to no ends. When Baba dabbed the cologne or smoked the cigarettes, he smelled magnificent, regal. I would hold onto him tight and inhale the mixed fragrance of foreign cigarettes and foreign cologne (yes, ‘foreign’ is the key word here). It was an inexpressible feeling. The words which come close to describe is the feeling of smelling chilli chicken for the first time…the smell of something alien yet amazing. The advent of shopping malls and internationalisation of domestic markets have robbed us of that feeling. You name a foreign brand, you get it right here. A conspicuous part of childhood was spent with my maternal grandparents. My grandma had a leather banded watch. When she travelled in a bus, she would fold the ticket longitudinally and tuck it under the leather band out of fear of losing it. Once she was home, she would take off her watch and hand over the ticket to me. (Yes, I collected bus-tickets and playing ‘bus conductor’ was one of my favourite games). But more than the tickets, what mesmerized me was the smell of the leather band. It would be slightly wet from her sweat, yet it exuded the soft lavender fragrance of ‘Cuticura’ talc (which came in orange and white bottles when we were kids). The blended smell of sweat, talcum powder and leather was one of the things, I wish, she left for me when she left. Its worth would have been a million times higher than all the jewelry I inherited from her. My mother always told me that the secret of Rapunzel-hair was coconut oil…the coconut oil which came in narrow plastic bottles in summer and broad-mouthed cylindrical tin cans in winter. The comb would dig in its teeth into my tresses and make way for the oil to flow. Ma would run her fingers across the scalp and I would close my eyes in ecstasy. With eyes closed, I would be transported to the seas. I confess that I was never particularly fond of the smell of coconut oil, but the feeling it emanated when eyes shut was magic! I could instantly see rows of coconut trees lining up the coast, sand drenched in sea water, the unrest of waves and the smell of salt. While Ma braided my oil-soaked hair, scenes from the seas also wove themselves into long plaits of memories. The courtyard at my maternal grandparents was a powerhouse of fragrances. Homemade pickles placed for sun-drying was not only one of the prettiest sights in the world, it also smelled delightful. The aroma of raw mango, red chilli or lemons embedded in mustard oil was a delight for the senses. The mali (gardener) would water the plants in the courtyard and a delightful fragrance would spring from the wet earth. It smelled of life, bloom and greenness. After watering the plants, he washed the courtyard. The cemented body bathed in the stream of water rushing down from the hosepipe. What if it didn’t rain every day, the smell of the wet courtyard made up for it. With the advent of autumn, its grey body would turn white. Hundreds of Shiuli flowers dressed it up for the upcoming Durga puja. The smell was intoxicating. The Shiuli tree also offered the joy of finding my favourite tricolour. White petals, orange stem and green leaves. The tree was infested with caterpillars. The branches were chopped off. The tree died eventually. The house changed its owners. A slice of my childhood changed too. Forever. Every evening in summer, guests would flock in. They were huge in number and infamous for spreading Malaria. Fancy repellants were unfamiliar. To ward off the little monsters, there were homemade secrets. “Dhuno” was one such. Fuming coconut shells were arranged in a terrracota pot (with a funnel base and an open top) and powdered incense was sprinkled on top. The smoke traversed from one room to another as someone constantly flapped the haat-pakha (hand-fan made of palm leaves) in order to keep the fumes alive. Sanjay Dutt may have glamourised the other-wise humble ‘Dhuno’ by performing a Dhunuchi-naach in Parineeta, but the truth remains that one of the chief purposes this wonder substance served was making Bengali households mosquito-free. 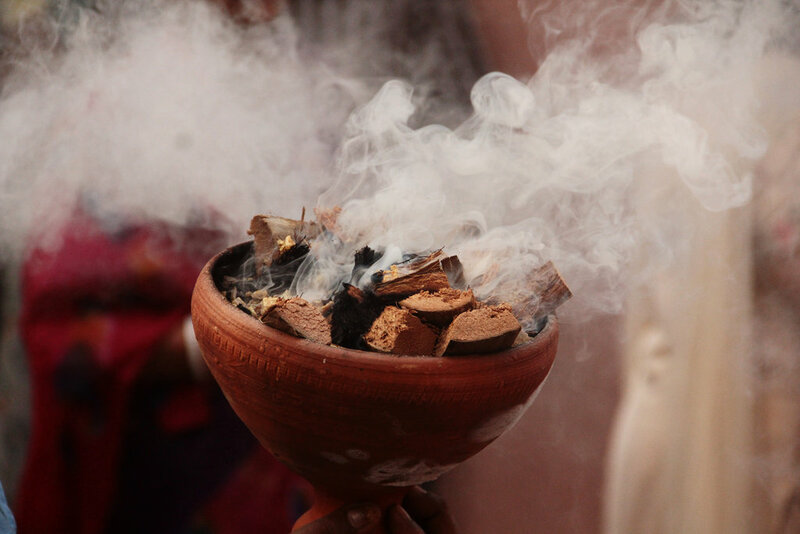 The overwhelming fragrance of camphour and burnt coconut shells spread all over the place. Ethereal! I wonder sometimes. Was it because camphour was its chief ingredient that Dhuno vanished in oblivion? Mosquito-infested evenings also remind me of another common phenomenon in Kolkata. Power cut. Every now and then, electricity would make a disappearing act. In those days (late 80s and early 90s), inverters or generators were not common in middle class households. So we would resort to hurricane lamps or lanterns. The flat wick would be rolled up and lit and the flame guarded with a glass chimney fitted in between four tiny spikes. The tinted glass-bodied fuel tank down below would be filled with kerosene every morning. The black soot clinging onto the inner surface of the chimney was cleaned too. As I write this, I am drowned in goose bump-evoking nostalgia. As soon as the wick was lit, the room would smell of kerosene. The smell! Aaaah….how delightful it was. The delight was rudely distorted by the fact that there would be school tomorrow and homework needed to be finished. I also loved the smell of new erasers. The tiny pink ones encased in silver sockets crowned wooden pencils. I never used these erasers. I only smelled them. My love for the tiny fragrant things served another purpose. I refrained from chewing the ends of the pencils. Then, there were white erasers with a green translucent layer on top. It used to have an alphabet printed on it and a picture of something the name of which started with that alphabet. They had a strange smell which amused me to no ends. New session and new shoes remind me of white shoe-polish which Ma put on Keds canvas shoes when she couldn't wash them. The smell of the whitener left me speechless. Baba had a wooden box. It had a honey-comb chamber. The beehive pattern resembled the steel-bodied armour guarding the external bellow of a harmonium. In each aperture, stood tiny slender glass bottles of Homeopathic medicines, corked up tightly. Some held white round sugar-coated balls while others contained ‘mother tincture’. In all those cute little bottles lied a smell so thrilling. The strong pungent smell of alcohol escaped the containers every time Baba opened them. Baba stroked the bottles and small droplets of liquor jumped into the mouth. The effervescent liquid mixed with the happiness of popping the small white sugar pills was ethereal. If I was a doctor, I would have relentlessly suggested Homeopathic medicines for all ailments. More than their healing values, I felt that they were instant mood-fresheners. They smelled magic! The smell of Inland letters and postcards was subtle and beautiful. 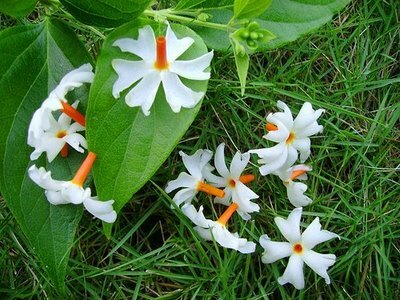 It is one such smell which you cannot describe in words. If emotions had a smell, it would emit the fragrance of letters. I am not really talking about scented letters that lovers sent each other, but about every other letter or postcard which carried the smell of the person sending them. Picture postcards sent from relatives travelling abroad were special. I could almost smell the place from where the postcard was sent. Figments of imagination of a little girl…..nevertheless. With the advent of emails, the personal touch, the smell and the warmth have reduced manifold. My grandmother never kept Naphthalene balls in between woolen clothes. She would make small pouches filled with dried red chillies, bay leaves, black pepper, cinnamon and other spices and put them in the trunks and suitcases, stored in the attic. In addition, she would put Eucalyptus leaves in abundance, sandwiched between the woolens and blankets. With the arrival of winter, they were brought down, soaked in sunlight and the whole place would smell like a valley of spices. I was six years old when my brother was born. I thought babies looked like those from advertisements of baby products. 26th August, 1989. I saw him for the first time. He looked like a lizard. I could almost hear my heart break into thousand pieces. Yes, I was sad at the sight. I didn’t like him at all. One day Ma wasn’t around. The baby was fast asleep. I had been deputed with the task of vigilance over him. I brought my face close to his neck and smelled him. I can never get over that feeling till death. That was the best smell in the world. He smelled of powder, pee and poop all mixed together. I unfolded the tiny palms. I rubbed my nose on his belly. I ran my fingers through the few strands of hair on his almost-bald head…..And, I cried out of joy. Nothing could, till date beat the experience I had on that day. He was the best smell in the world. I may have my own babies someday, but he shall always be my first. The joy of holding him in my arms and drowning in a pool of baby-fragrances was, is and shall always feel like paradise…a paradise that I call ‘home’. This post is written for a contest hosted by Ambipur. And the guidelines are here. - Remind me to carry a stack of five-rupee notes the next time we meet. - The aroma of a wet courtyard is something I had never thought anyone would notice, let alone cherish. - One of my personal favourites is the aroma of sun-baked mattresses in Kolkata summer. - I love the way you managed to give me goosebumps and made my eyes moisten throughout the post. Great post... sometimes a single whiff of a forgotten smell can ignite a thousand memories. Thank you so much Biju. Great post...I can relate to it completely. Sometimes a single whiff of a forgotten smell can raise a nostalgic turmoil. Have you watched that dark and stunning movie called ' perfume: story of a murderer'? Read the poem the cinnamon peeler's wife by ondaatje? And babies should be smelled and nuzzled. Yes, I have watched Perfume:the story of a murderer a few years back. One of my trainees had given me the movie. I loved it. No I haven't read the poem. *Deep breath* Okay, I don't know what to write. It would be stupid to say anything now. I will just let this post sink in. I can't stop loving you for making me feel good every single time you write. Diptee, I love you too. Thanks would be an understatement. You made my day. Great post Diptee di. I agree with you on every note! You're a charmer! You really are.. Wonderfully painted words you've used, wonderfully preserved memories and most wonderfully selected scents.. I have myself mentioned a few of these odours in my post, with the Sunday-mutton being an obvious choice.. LOVED IT! P.S. Just wondering.. you're not a 'probashi' Bangali, are you? Because a 'probashi' like me, seemed to enjoy your post a little more than my indigenous Bengali cousins. Thank you so much for the debut visit (?) and the praises :D Thanks. I read your post and absolutely loved it. P.S: I was born and brought up in Kolkata. Have never lived any where else. your post smells love. the last part makes me try to swallow hard a lump in my throat. the smell of a sunday-afternoon-mutton-with-a-red-oil-film-on-top is something that I keep craving even today. It brings back 'mahabharat', my grandparents and as you so correctly pointed out 'oily braided hair'. how I miss all of this. Thank you re, Srimanti. You made me feel good too. Nobody oils hair today.My grandparents are dead and gone. I steal smells from a roadside bakery today.Entering it and tasting its smells. Or sometimes when it rains. Even the chai ki patti's smell is not the same. Smell between a woman's breast can lull a man asleep.that is some smell. I know "oiled hair" days are gone. I miss them. That's exactly why I wrote about them. Working in a swanky office with oil dripping from all over your head isn't a pretty sight, na? Yes, the tea leaves do not smell the same. But they still smell of warmth and happiness.....for me. I like smell of dominos. Of wet earth after rains. Your potpourri of memories of all sorts of smells, reminded me of one of my favourites; The smell of oil paint, once they are dabbed on canvas after mixing with tarpin oil. This smell was intoxicating. And I just lost it once I stopped painting. Will write on "New things that are good". Thanks for the idea. My head is so blank all the time. Good to know you like Binoy Majumdar. He was a magician. "If childhood was a fairy tale, I would have dog-eared the pages on ‘Sunday mutton curries’ forever." Can I sneak into your brain and steal a fragment of it? Of course you can, Diptee. You will land up in a pool of filth, dirty ideas, double-meaning jokes, sarcasm and meanness. Don't blame me later.